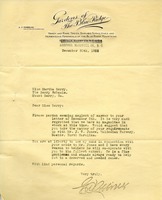 Letter to Mr. Fraser from Martha Berry hoping that he is taking care of her order as well as asking when he can return to Berry because she wishes to have some Magnolias and Cedars moved. She also informs him that things seem to go much better when he is at the Berry Schools. Martha Berry thanks Mr. Young for his donation of the magnolia seedlings. 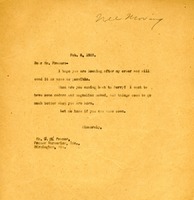 Robert C. Young offers to give Martha Berry 10-15 magnolia seedlings free of charge. 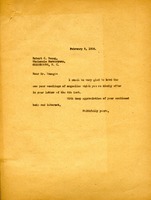 Robert Young is writing Martha Berry to inform her he does not have any magnolia trees. He enclosed a price list for her to look at. 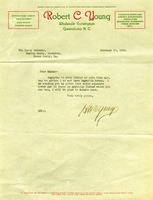 E. C. Robbins writes to Martha Berry discussing the company's lack of Magnolia trees, and he suggests that she contact the Valdesian Nursery in Bostic, North Carolina.